I found this in the ubuntu documentation. Tasksel is an installation system that is an integral part of the Debian installer; it is also included in Ubuntu. Tasksel groups software packages by tasks and offers an easy way to install all the packages needed for that task. It provides the same functionality as using conventional meta-packages. Tasks are defined in .desc files found in /usr/share/tasksel. Debian derivatives can easily add tasks. Since Ubuntu 6.10 (Edgy) tasksel has been included as part of the base installation. Tasksel is present on all versions of Ubuntu’s installer, but previously was not installed on the base system. Already-installed tasks will have an asterisk beside their name. Select a task by scrolling down and pressing space. This will put an asterisk beside the selected task and mark it for installation. Removing an asterisk marks the task for removal. 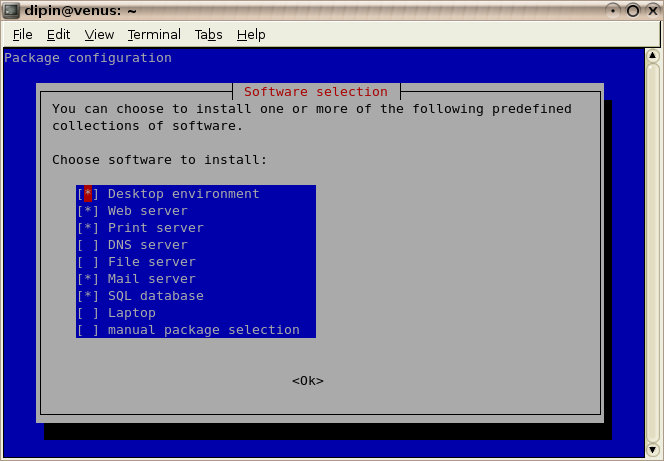 Once “ok” is selected the task installations and/or removals will take place using apt-get. You can also directly specify which task to install.